Who doesn't love All Inclusive? An All Inclusive Country? The only way it should be! All Inclusive Video? Wait, what? Yes, All Inclusive Video...you know, video that captures everything - in front of the lens, behind the lens, above the lens and below the lens. You are probably thinking you need some big, expensive rig to capture 360 degree videos, but that is not the case. The MGCOOL 360 Cam is a tiny $169 Action Camera that captures video all around you and lets you create 360 degree videos or Virtual Reality ready videos. As you watch the videos above, you see the real secret to the MGCOOL 360 Cam success are the dual 220 degrees by 220 degrees panoramic lenses. The tiny action camera is actually recording two video feeds - one on the front of the camera, the other on the back. Some additional magic happens on the computer when you run the 360 App software. The software is able to stitch the two video streams together and provide you with a video file in a number of different 360 degree formats. Services like YouTube and Facebook have 360 degree players, so users will be able to pan all around your videos and see everything that was going on. If you have a pair of Google Cardboard or other VR headsets, you can watch your 360 degree videos in Virtual Reality. 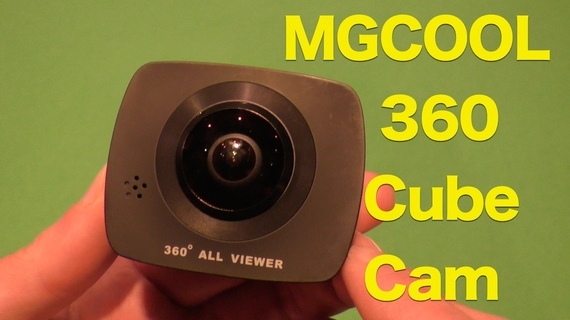 The video quality on the MGCOOL 360 Cam could be better and the software to stitch the videos together is not the most user friendly, but these are minor annoyances. The fact that you can create 360 degree videos with a tiny camera that sells for under $170 is pretty impressive. If you ever wanted to test out creating VR and 360 degree immersive videos, the MGCOOL 360 Cam is an excellent way to do it.